How long will Harry Bosch remain in the gumshoe game? Has the Bosch TV show been cancelled or renewed for a fifth season on Amazon? The television vulture is watching all the latest TV cancellation and renewal news, so this page is the place to track the status of Bosch, season five. Bookmark it, or subscribe for the latest updates. Remember, the television vulture is watching your shows. Are you? An Amazon detective drama, Bosch stars Titus Welliver, Jamie Hector, Amy Aquino, Madison Lintz, and Lance Reddick. Based on the Michael Connelly book series, the Bosch TV show follows dogged Detective Hieronymus ‘Harry’ Bosch (Welliver), of the LAPD’s Hollywood Homicide Division. Although something of a rebel, this military veteran who served in both Iraq and Afghanistan, knows the rules and when to break them. The son of a murdered prostitute, Bosch is always seeking justice, despite the imperfect system of which he is a part. On February 13, 2018, Bosch was renewed for a fifth season which will debut TBD 2019. The series has also been renewed for a sixth season. Stay tuned for further updates. There’s no need to worry about whether Amazon will cancel or renew Bosch for season five. They greenlit the fifth season, two months prior to the season four premiere. 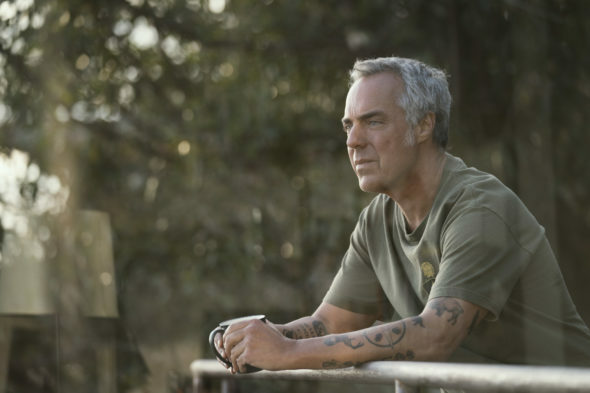 Since Amazon has issued early renewals for Bosch before, it is unclear whether this is for a “fifth and final season” or if there will be future installments on the way. For now, I’ll keep a hungry eye on the trades and update this page with breaking developments. Subscribe for free Bosch cancellation and renewal alerts. Find more Bosch TV series news or other Amazon TV show news. What do you think? Do you think the Bosch TV show would be renewed for season five? How would you feel if Amazon had cancelled this TV series, instead? I read the Bosch Series, absolutely love the show, even my husband has gotten into the cast and watching the episodes with me. Keep up the excellent work and story line hope this show lasts a long time. Season 4 don’t miss the great acting, suspenseful story line, intrigue galore. best series ever. Bosch is a total rockstar! I’ve read all the books, seen all the series’ seasons, and would be highly perturbed, should it be cancelled. Titus Welliver is perfect as Harry Bosch! This is the best show on Amazon. Please keep this show on TV Amaz0n, for years to come. Superb modern police drama series, as long as they make it, I will watch it.